Sometimes babies are so peaceful and quiet in the backseat that we can forget they are even there, and it can be tempting to leave a sleeping baby in the car so we don’t have to wake them up while we quickly run into the store. But leaving a child alone in a car can lead to serious injury or death from heatstroke, even in cooler temperatures. Here’s some helpful information and tips for parents about heatstroke prevention for kids. On average, every 10 days a child dies from heatstroke in a vehicle. In more than half of these deaths, the caregiver forgot the child was in the car. Young children are particularly at risk, as their bodies heat up three to five times faster than an adult’s. Learn more about protecting kids from heatstroke and other areas of safety in and around cars, including car seat safety, booster seat safety and seat belt safety; driveway safety; how to avoid getting trapped in the trunk; and how to prepare teens and preteens for driving before they get behind the wheel. For those living in states with no laws about leaving children unattended in a car, this printable poster is a reminder to A-C-T. 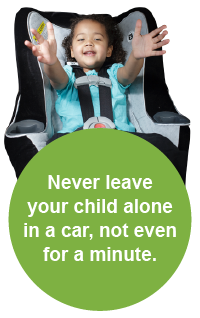 This heatstroke poster is a reminder for those living in states with laws about leaving children unattended in a car.